The 100 µm scale bar applies to all figures except fig 2. (with a horizontal 10 µm scale bar), fig. 5 (with a vertical 10 µm scale bar), and fig. 7, for which the large scale bar corresponds to 75, and not 100, µm. Fig. 1. Stichopilium bicorne. BSS 61B(F) EF F42. Figs. 2-5. 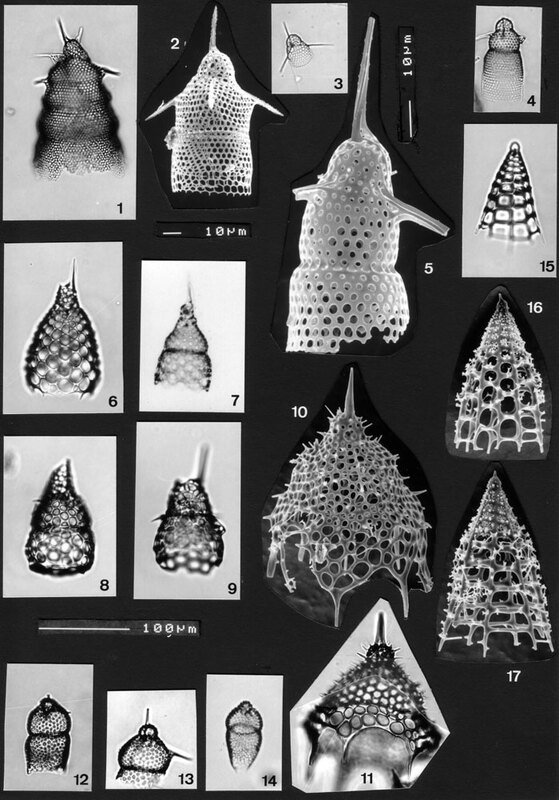 Stichopilium krügeri, showing variation in porosity (total shell surface vs. pore surface) and outline of the thorax. All BSS; 28B(III/85), 31B(FI) EF U29, 31B(F) EF N39 and 28B(III/386). Fig. 6. Lamprocyclas nigriniae. BSS 11B(F) EF D34. Fig. 7-9. Lamprocyclas junonis. BSW P47(F)., BSS 49B(F) EF Q42 and BSS 27B(F) EF C42. Figs. 10, 11. Lamprocyclas aegles forma monumentum. BSS 28B(II) and BSS 19B(F) EF C54. Figs. 12-14. Eucyrtidium veneris. BSS 15B(F) EF S21, IOW 134(F) and BSS 15B(F) EF E50. Figs. 15-17. Bathropyramis quadrata. BSS 25B(F) EF F47, and 2x 28BUD. Note secondary ornamentation and infilling of the uppermost pores in figs. 16 and 17.